Hollywood celebs are clearly narcissists. They believe the universe revolves around them. But their latest attempt to bring about “social change” met pushback from the last person they expected. The Democrats have a plan. They want to turn every state blue. Then they can push through all their socialist schemes. That’s why they poured obscene amounts of resources into key states. Texas, Georgia, and Florida all saw heavy Democratic attention. Hollywood celebs turned Beto O’Rourke into a national name. He had no distinct track record. Big leftists also hyped up Florida gubernatorial candidate Andrew Gillum. But Georgia gubernatorial candidate Stacey Abrams got the royal treatment. Hollywood titans like Oprah Winfrey endorsed Abrams for governor. But as was the case with O’Rourke and Gillum, Abrams lost. And the left didn’t take it well. Hillary Clinton accused Republicans in Georgia of rigging the election against Abrams. Leftist Ohio Senator Sherrod Brown said the same thing. Hollywood swooped in to declare election theft. Celebs like Alyssa Milano even proposed film shoots boycott Georgia. Conservative actor Nick Searcy pointed out the obvious. Their leftist policies drove those film shoots out of state in the first place. But Abrams herself drove the final nail in the coffin of the dumb boycott. This is a clear case of how the left operates. They don’t think about the consequences of their actions. They want to “punish” Georgia for not voting the way they want. The truth is there was no voter fraud. Voters who hadn’t voted in many elections were purged from rolls. And others who didn’t accurately update their info received “pending” status. Democratic state legislators created many of the rules the left now hates. It’s easier to blame the loss on racism. There’s another fact Hollywood leftists don’t grasp. Even if the boycott worked, productions would move to another state with tax incentives. The left has no concept of economics. The “Democratic process” has a new meaning. It now means Democrats complain about any election result they don’t like. According to them, Republicans stole Georgia. They also stole a Florida Senate seat. Never mind it was Democrats trying to add heaps of votes after Election Day. Gillum revoked his concession and claimed racism. 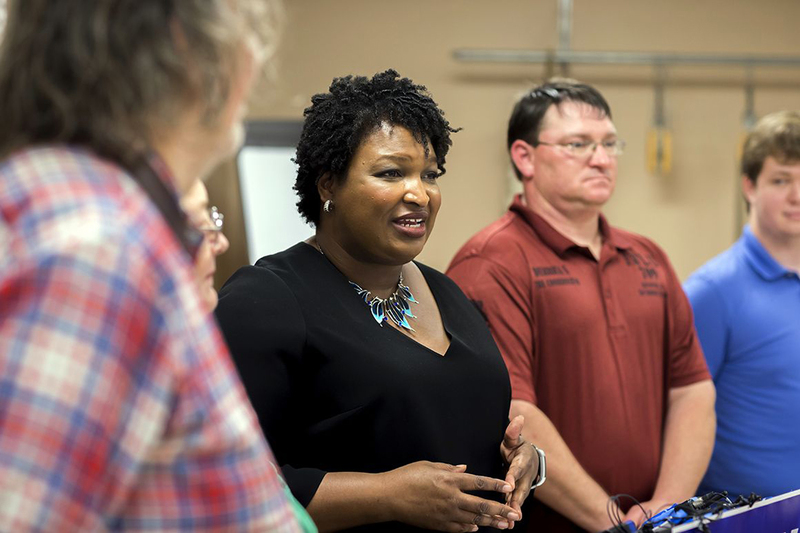 Abrams refused to call Brian Kemp the legitimate governor of Georgia. Meanwhile, in Arizona, Republicans didn’t make a fuss about the Democrats finding boxes of ballots in a school. In California, Republicans didn’t cry about GOP candidate John Cox winning in Orange County, but the entire county mysteriously going blue in the House races. In Florida, Democratic official Brenda Snipes bungled the process so badly, she resigned. But somehow Republicans are the ones up to no good.